Dundee midfielder Gary Harkins may have shared his views on a potential Scottish Cup quarter-final with Rangers, but Dumbarton manager Stephen Aitken has not let the prospect of travelling to Ibrox enter his thoughts ahead of tonight’s fifth-round replay at Dens Park. 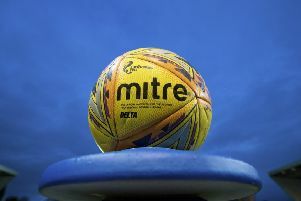 Aitken believes that defeating a Dundee side sitting in the top six of the Premiership is requiring all his attention, and he is not going to be side-tracked over the prize that awaits in the next round. “A few people have been asking me about the prospect of facing Rangers but I told them that I have not even thought about it,” said Aitken, whose side earned a 0-0 draw in the initial tie. “It was a good achievement from us to hold Dundee to a draw in the first game and it would be a great achievement to win the replay. The Sons hope to have their striking pair Christian Nade and Garry Fleming available after they missed out on Saturday’s 1-0 defeat by St Mirren because of injury. Aitken added: “They are both good players with plenty of experience as well as having a good physical presence. To miss one is going to hurt you so to be missing both blunted our attack quite a bit. On-loan Celtic youngster Jamie Lindsay looks set to be the only absentee from the Dumbarton ranks as he is still troubled by a cut foot. Dundee manager Paul Hartley, whose side drew 0-0 with Kilmarnock on Saturday, has an unchanged squad. Former Aberdeen midfielder Nicky Low remains sidelined with ankle trouble, Daryll Meggatt is working his way back towards fitness after a hernia operation, while James McPake is out for the rest of the season with a knee injury. Hartley said: “I think because of where we are in the league and where Dumbarton are, leagues apart, sometimes people think it is going to be an easy game for us but these games are difficult.